This is a limited edition, slip case style promo box. 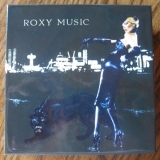 It contains five Roxy Music mini LP CD titles and it came with five promo obis. Promo Issues / Comments:This box was issued with five promo obis. This is a limited edition, slip case style promo box. It was issued containing five Roxy Music mini lp cd titles and it came with five promo obis. Images of all individual releases can be found on this site from the following links.